Great for training, or interactive fun! Looking for a soft toy for your tough chomping dog? This is a great choice. Tough and long lasting, Use interactively with one or multiple dogs. It can be used as a Frisbee or a tug toy. Great for flyball training -- soft edges won't hurt gums. Great For Indoors! Washable! And Floats!! What's great about the Ultimate Gear Ring? The Ultimate Series dog toys have up to Seven Layers of Stitching: It starts with 2 layers of Luggage grade material. Certain layers of material are coated with a layer of plastic to hold the material fibers together. Soft fleece is used for the outside layer to make it comfy. PFor the Ultimate series there is an additional layer of webbing, whenever possible around the outside edge to cover the seams of the toy. This is sewn multiple times, for added durability. Squeakers are sewn into material pockets inside the toy. This additional layer of safety can give you the time you need to safely remove the toy in the event your dog reaches the core of the toy. What sets Tuffys Toys apart? Although this toy is tough, it is not designed to be a chew toy. The Tuffy’s Series Toys are designed to be play toys and not chew toys. No Part of any toy should be ingested. If your dog is a tough chewer this toy should only be enjoyed with supervision. 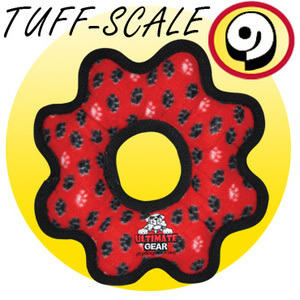 Read 6 customer reviews of Tuffy Toys Ultimate Gear Ring. The average customer rating is 4.2. Our Labrador Capri didn't seem interested in her toys after her mate Mocha passed away 3 months ago. We purchased this toy with the hope of getting her interested in playing again and it has done the trick! Capri is fascinated by the shape and texture of the toy, plus the challenge of getting it to squeak as they are very well sewn in. 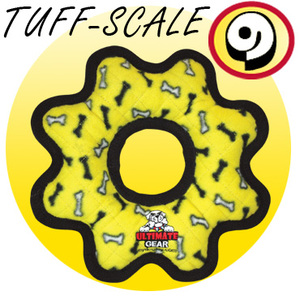 A great purchase for dogs who usually give their toys a bit of rough and tumble. A very tough toy for sure. However our dog less interested as it is not as soft and floppy as traditional soft toys. It is a rigid ring. Also the squeakers are awkward to squeak as they are so protected! A 6-month old Collie who likes soft things find this a bit too tough for his liking. I bought this since he chew off soft toys and others (like socks) quickly. He isn't too fascinated by the texture and shape of this. Still enjoy tug-a-war game with it but of his own preference he never picks this up by himself. The squeaker is also difficult for him to sound, perhaps due to its toughness. It is a challenging trade-off toughness versus soft texture. I have to give low rating since he still never play with this by his own choosing. Very tuff ,exactly what one needs for playfull dog ! Great toy for playing tug my dog loves it.